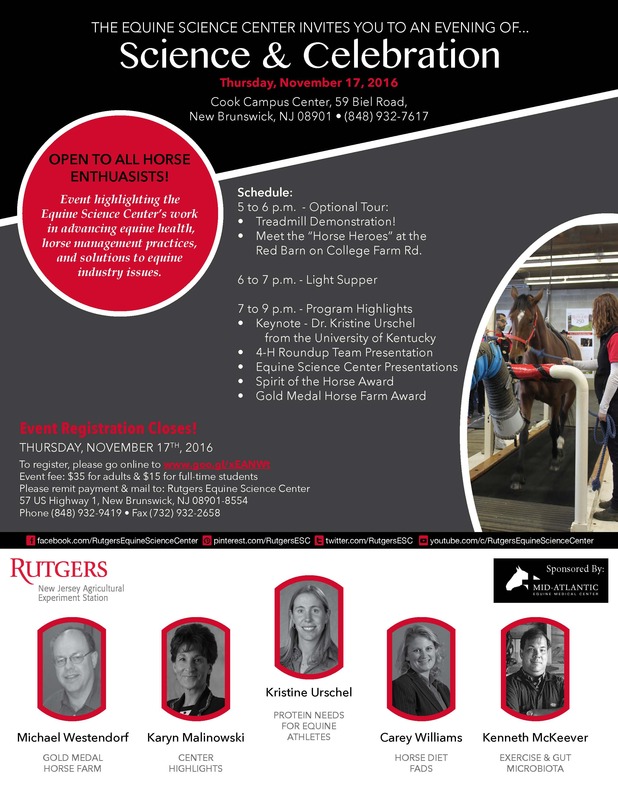 New Brunswick, N.J. – The Rutgers Equine Science Center will host its 2016 “Evening of Science & Celebration” on Thursday, November 17 from 6:00 – 10:00 pm at the Cook Campus Center in New Brunswick, NJ. The event is being sponsored by Mid-Atlantic Equine Medical Center. This year, Kristine Urschel, Ph.D. will deliver the keynote presentation titled, “Protein Needs for Equine Athletes”. Dr. Urschel is an Associate Professor of Equine Science in the Animal & Food Science Department at the University of Kentucky. Her research focuses on studying protein and amino acid requirements and metabolism in horses of all ages and physiological states, especially during and after exercise. The Center will present its annual Gold Medal Horse Farm award to the Nienart family from Hidden Hills Farm in Hillsborough, NJ. The award, part of the New Jersey Equine Environmental Stewardship Program, gives recognition to outstanding equine farms for their dedication to environmental sustainability and management. It also underscores the efforts of the New Jersey equine industry to maintain the beauty of the Garden State. The program is a collaborative initiative by the New Jersey Agricultural Experiment Station at Rutgers University, the Rutgers Equine Science Center, and the New Jersey Department of Agriculture. An “Evening of Science & Celebration” will begin promptly with dinner at 6:00 pm. After dinner, Madison Whiting, a New Jersey 4-H Horse Project member will present her award winning presentation, “What’s for Dinner?” about the odd things that horses eat.